A coalition of Austin-based immigrant rights, student and faith organizations joined community and labor groups in thirteen major cities nationwide on Tuesday, January 24th in protests against private detention company investments. Protestors are calling for major investors such as Wells Fargo to divest of their holdings in the for-profit private prison industry. According to SEC filings, Wells Fargo currently holds over 3.5 million shares in private prison corporation GEO Group and as well as shares in Corrections Corporation of America. 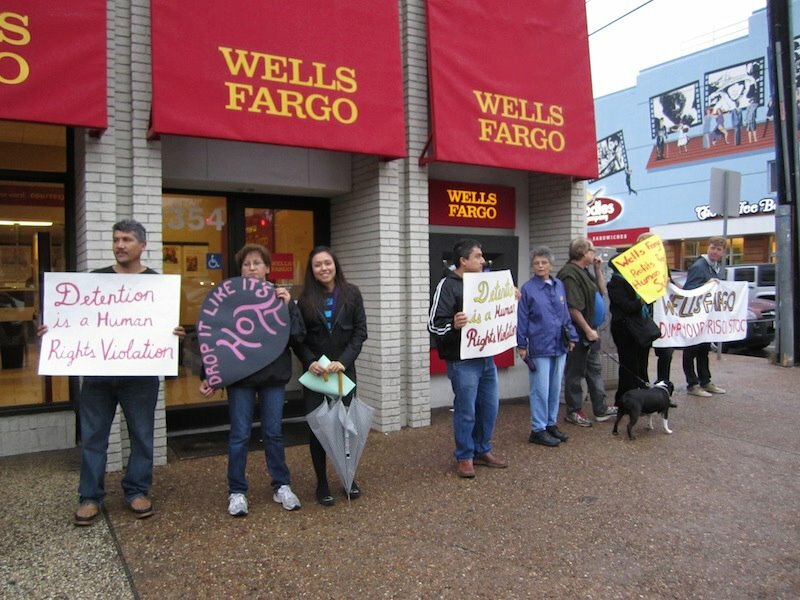 Participants gathered outside the Wells Fargo bank on Guadalupe Street across from the Universoty of Texas. Organizers deilvered a letter to Well Fargo from community groups and faith organizations. “Wells Fargo’s support of the GEO Group is even more troubling in light of GEO’s history in Texas,” said Carmen Llanes of Texans United for Families. GEO’s facilities include prisons, immigration detention centers, and juvenile detention centers where people have suffered from inadequate medical care and unsafe and unsanitary conditions. Deaths, riots, and hunger strikes at GEO’s facilities are indicative of GEO’s culture of cruelty and underscore the need to end construction of new GEO facilities.